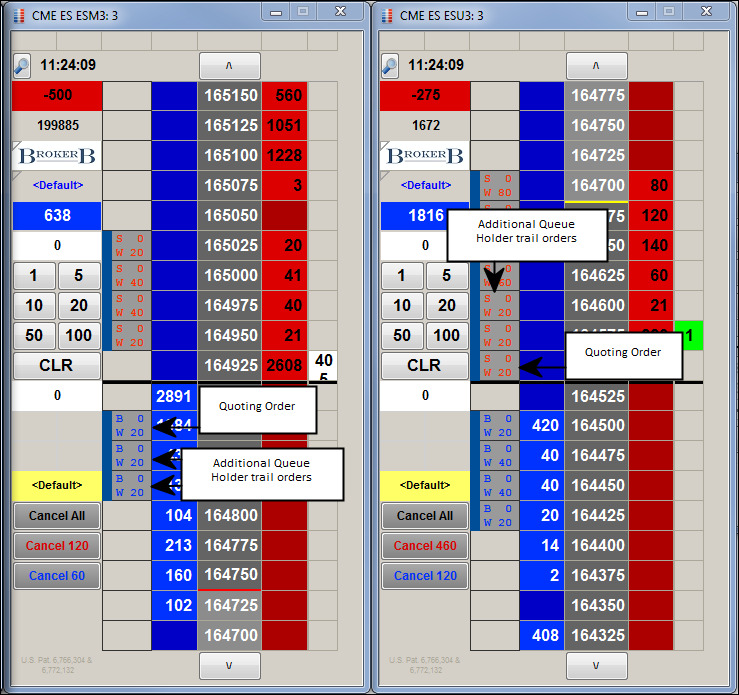 Queue Holder lets Autospreader use multiple orders per leg to maintain your position in the queue when requoting to a new price level. The standard quoting order enters the outright market at the price determined by the spread price. 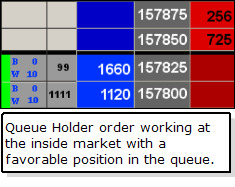 The Queue Holder orders enter at consecutive price levels away from the inside market. 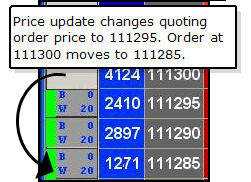 When Autospreader receives a price update, the order queue rotates. Whether the queue rotates toward or away from the inside market depends on which side of the inside market the new price appears. 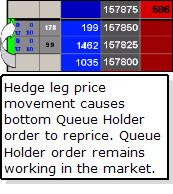 When a Queue Holder order is filled, an offsetting hedge order is sent and remaining Queue Holder orders on both legs are deleted. 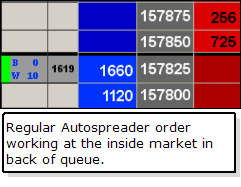 However, it is possible for all of your Queue Holder orders to get filled if the market is swept before X_TRADER recognizes the fills and processes the delete. The Queue Holder function only works on spreads with two legs. 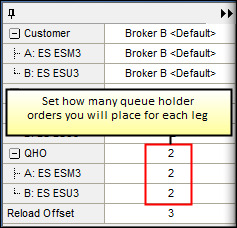 When a spread contains more than two legs, the Queue Holder property is disabled. 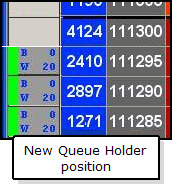 You can manually drag and drop Queue Holder orders to new price levels. 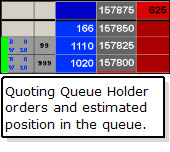 In the case of a partial fill, the remaining Queue Holder orders are reduced by the filled amount. 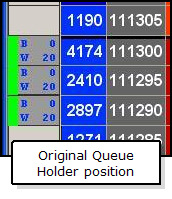 You can set up to 10 queue holder orders per leg. Algos cannot be used in conjunction with the Queue Holder feature. 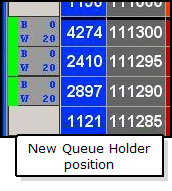 You can enable Queue Holder orders in the spread configuration. 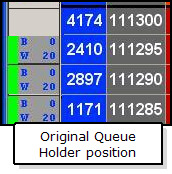 Queue Holder order values set in the spread configuration also appear by default in the spread pane side-bar window in the Queue Holder per leg value fields. 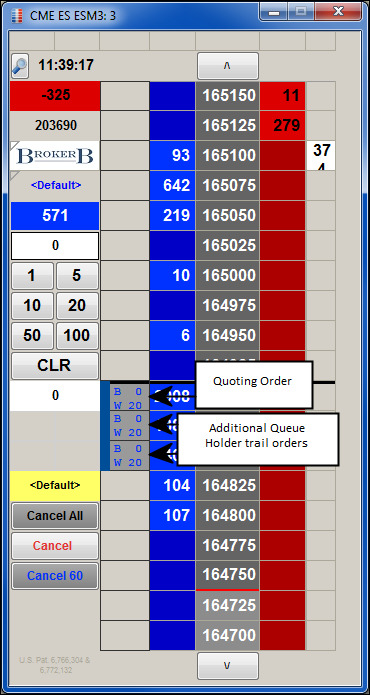 Existing Autospreader spread configurations set with Queue Holder orders will automatically appear with the QH button enabled. From the Autospreader Manager dialog box, click the spread in which you want to enable Queue Holder and click Edit. Under Order Properties, next to the Queue Holder Orders field, type how many extra orders you want to trail your quoting order. Once enabled, a QH button appears on the spread pane and is shaded yellow. 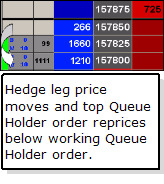 This indicates the next order you place in the spread pane will submit trailing Queue Holder orders in the associated legs. You can stop sending Queue Holder orders by clicking the QH button. Click the spread pane side-bar to access the side-bar menu. Under the QHO (Queue Holder) section, indicate how many Queue Holder orders you want to trail your submitted order for each leg. 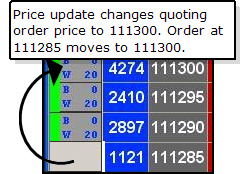 Set proper values in both the Max Price Move and Max Order Move fields, which are listed in the Quoting Properties section of the Configuration Dialog Box. 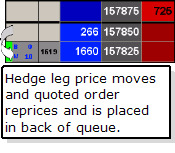 These fields help prevent legging risks by pulling working orders during volatile price moves. Price movement away from the inside market will remove the Queue Holder order closest to the inside market and place a new order at a price level at the end Queue Holder trail. Price movement toward the inside market will remove the Queue Holder order at the end of the trail and place a new order at a price level toward the inside market. The following examples illustrate the challenges regular Autospreader orders can have versus Autospreader orders using Queue Holder.